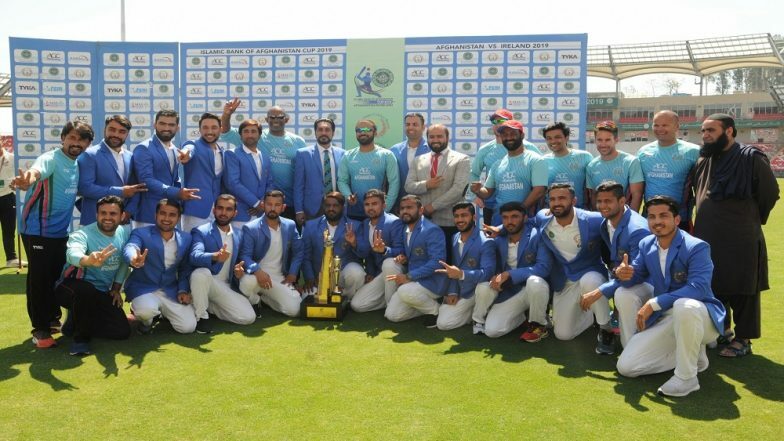 Dehradun, March 18: Afghanistan skipper Asghar Afghan is elated after his side's maiden Test win and has described the victory as 'special' for his nation and countrymen. Playing their second Test, the war-torn nation witnessed some all-round effort to register a comfortable seven-wicket win over Ireland on Monday, on the fourth day of the match. Speaking at the post-match presentation, Asghar said: "Happy that we won. Really happy for my team, people and the cricket board. Before we used to play two-day, three-day cricket and now we are playing the longer format and getting to play Test cricket." "It's a special feeling. I want to congratulate all the lads in the team, they have been absolutely brilliant. We have got a few games before the World Cup and we want to make every opportunity count," he said. Meanwhile, Rahmat Shah who smashed half-centuries in both the innings, which helped him being named the 'Man of the Match', also congratulated his countrymen on the historic win and praised the bowlers. We Can Beat Any Side If We Bat Well, Says Afghanistan All-Rounder Mohammad Nabi. "I would like to congratulate the country for this historic win. The wicket in the ODIs was more suited to spin, this wicket was suitable for batting. (I am) glad to have scored some runs for my team," he said. "I stayed at the wicket and we played session by session. Want to give credit to the bowlers, they bowled really well," Shah said. On the other hand, Ireland skipper William Porterfield said their batting didn't click as per the plan, resulting in the defeat. "First innings didn't go as per our plan. When you win the toss and bat first you have to capitalise on that. Had we batted anywhere close to how we batted in the second innings, it could have been different," he said. "Take nothing away from Afghanistan -- they deserved win, they played really well. It was our second game. Quite a few players made their debut and I'm sure some of them want to kick on and contribute more. It's been a long tour, but the lads have been very good. You are never tired to play Test cricket, it's always a special feeling," he said. It was Afghanistan's second Test match. They made their Test debut last year against India in Bengaluru.